It is my Friday lay day and I am quite distracted with other commitments. But at the London presentation a few weeks ago, I mentioned that I would scrap central banks and consolidate their functions within a division of what we now think of as Treasury departments (or Finance Ministries). Whenever you say that there is a ridiculous response from those who claim to know something about banking along the lines of either, it would cause hyperinflation or that the politicians cannot be trusted. Both arguments are as I say – ridiculous. There are some things that central banks do that are necessary, for example, maintain financial stability through the integrity of the payments system. They also, depending on the nation, manage foreign reserves although that function is unnecessary if exchange rates float. Yes (flame suit on) I know less developed countries face exchange rate volatility and have to import food to survive. Which brings me to the point. The first part of scrapping central banks is to eliminate their ideological/political function. They are bastions of conservative mythology – pick whichever one you like – expanding the money supply is inflationary, ‘printing money’ is inflationary, politician meddling in monetary policy is inflationary, financial markets will desert a country that does not have an independent central bank, etc ad nausea. Politicians also use the so-called independence of the central banks as a way of deflecting policy responsibility for mass unemployment. Modern Monetary Theory (MMT) does not advocated doing away with the functions that are legitimately performed within the current central banks. It would stream-line some and make other functions redundant, but what it would do away with is this incessant cycle of ideology that emanates from these institutions. The other point is that there is a lot of conditionality in some of the policy suggestions I propose from time to time under the guise of MMT. One proposal relies on another. For example, a nation doesn’t have to have a central bank running ‘exchange stabilization funds’ if it lets the currency float. Obviously. But then what about poor nations who have to import food and fall prey to speculative attacks on their exchange rate by Wall Street investment banks? First, a new international organisation is required to replace the IMF that would serve to provide poor nations with necessary foreign currencies to ensure they can maintain acceptable material standards of living if their exports fall or the currency depreciates too much. Second, an overwhelming proportion of financial market transactions are totally unproductive and should be made illegal. Then the capacity of financial flows to undermine the viability of a nation with a floating exchange rate is rendered impotent. You see the conditions emerging – this, then that, then that. Doing one thing without the other becomes problematic. A major reform agenda is required. I will write more about this in the coming months (perhaps). Today I am just sketching the plan. Which brings me to an Op Ed by British economist John Kay (September 8, 2015) – We Were Better Served By Old-fashioned Relationship-focused Bank Managers. I don’t often agree with John Kay, but in this case the words have concurrence. He waxes lyrical about his school days “in Edinburgh in the 1960s” where the banks were banks and not gambling casinos (my words). Banking was then a career for those who did not quite make the grades required by the good universities. If they joined either of these two institutions, they might with diligence become branch managers after 20 years. The bank manager was a community figure who would base his (they were all men) lending decisions as much on his local knowledge and the character of the borrower as on figures. The GFC is the only evidence we need to cite to confirm the incompetence of these self-styled geniuses in the financial markets. The growth in the size of the financial sector, the explosion of remuneration and the changes in the nature of financial activity were not to any large degree driven by changes in the needs of the non-commercial economy for financial services. These needs — the operation of the payments utility, the management of personal wealth across lifetimes and between generations, the allocation of capital between different forms of productive investment, and the pooling of risks — have changed very little. In other words, these financial geniuses just invented a new playground for themselves which involved the “massive increase in secondary market trading of existing assets”. Nothing productive at all. Parasitic at best. I have often said that the vast majority of transactions that go on daily in financial markets (over 95 per cent) are “self-referential … the primary activity of financial institutions is trade with other financial institutions”. They wealth shuffle and gamble against each other. They use the largesse that has been taken from workers as real wages have lagged behind productivity growth and real firms (that is, non financial) have failed to reinvest the growing profits in productive infrastructure. Rather, the increased profit share in growing economies has been increasingly channelled into the unproductive financial markets to give the geniuses some play money. … the ability most valued in the finance sector in the first decade of the 21st century was a keen appreciation of asset markets themselves. The deployment of such abilities by people with an exaggerated idea of the relevance of these skills, and an overblown sense of their own competence, plunged the global economy into the worst financial crisis since the Great Depression. He implicitly suggests we would be better off going back to the old banking models. This is core MMT policy. I wrote about it, in part, in these blogs – Asset bubbles and the conduct of banks and Operational design arising from modern monetary theory. To repeat the only useful thing a bank should do is to facilitate a payments system and provide loans to credit-worthy customers. Attention should always be focused on what is a reasonable credit risk. First, banks should only be permitted to lend directly to borrowers. All loans would have to be shown and kept on their balance sheets. This would stop all third-party commission deals which might involve banks acting as ‘brokers’ and on-selling loans or other financial assets for profit. It is in this area of banking that the current financial crisis has emerged and it is costly and difficult to regulate. Banks should go back to what they were. Third, banks should be prevented from having ‘off-balance sheet’ assets, such as finance company arms which can evade regulation. Then the financial wizzes would get bored and perhaps go off and use their nearly infinite intelligence (not!) to cure cancer or help stop global warming. And while on the topic of banks … which own various companies as speculative ventures (which would be banned under my proposal above), we read the following. The UK Guardian reported (September 10, 2015) – Next chief says ‘national living wage’ could drive up inflation – which was just part of an emerging campaign by businesses in the UK to resist the increases in the minimum wage foreshadowed in the last British fiscal statement. … cost the company £27m a year by the end of the decade and risks creating a potentially harmful inflationary loop. A fair proportion of NEXT’s workforce are “paid less than the national living wage at present”. Wolfson was earning just (a measly) £350 an hour at the time apparently. … the clothing chain had 30 applicants for every job advertised. So keep unemployment high and suppress wages – the same old. CEO was paid £743,000 pounds as his base pay in the financial year 2014/15. He was paid the maximum bonus of 150 per cent of his base salary because the “pre-tax EPS exceeded growth of 15%” which turned out to be £1,115,000. Pre-tax EPS growth achieved in the year excluding exceptional gains was 14.7%, which became 16.9% after making the prescribed adjustment for special dividends and was well in excess of the 15% EPS growth at which point bonus reached its capped level. Accordingly, a bonus of 100% of salary for the executive directors and 150% of salary for the Chief Executive was earned. I like the use of the term “was earned”. In addition, he was paid “Benefits” of £50,000, a contribution of £140,000 to his “Pension”, a “Salary Supplement” of £112,000, a payment under the so-called “Long Term Incentive Plan” (LTIP) of £2,500,000 on top of the base salary and bonus. Total pay last financial year: £4,660,000 which I am sure Simon Wolfson would consider modest and rather frugal of the company to say the least. He claimed that the pay rises would force the company to pass them on as higher prices. The rate of growth in profits for the company has been above 10 per cent for the last two financial years (11.8 per cent 2013-14, and 12.5 per cent 2014-15) and EPS rose by 17 per cent in 2014-15. What might not be fully appreciated is that the British government pays supplements to low wage workers (estimated at £11 billion a year) to the 22 per cent of workers who are paid below the Living Wage in Britain. A Report released earlier this year from Citizens UK – The Public Subsidy to Low Wage Employers – is salutary reading. The high EPS and bonuses and all the rest of it that Next report in glowing terms to their capital holders are in part just a dirty form of corporate welfare. This UK Guardian article (April 20, 2015) – Taxpayers spend £11bn to top up low wages paid by UK companies – is about that. There are various government schemes (tax credits, payments etc) that make up the public subsidy to low wage employers. … a direct transfer from the rest of society to some of the largest businesses in the country … Worse, this is a direct subsidy for poverty pay. If supermarkets and other low-paying employers know they can secure work even at derisory wages, since pay will be topped up by the state, they have no incentive to offer higher wages. Companies like Next are in effect welfare scroungers. And the company is owned by various financial market investment banks etc – all very happy to be on the public teat! I did this interview for the ABC national current affairs program PM late yesterday (September 10, 2014) – Jobless rate falls slightly but still above 6 per cent – in relation to yesterday’s labour force data release by the Australian Bureau of Statistics. My analysis of the latest data is at – Australian labour market – flat and not looking very prospective. You can also hear the segment – HERE. 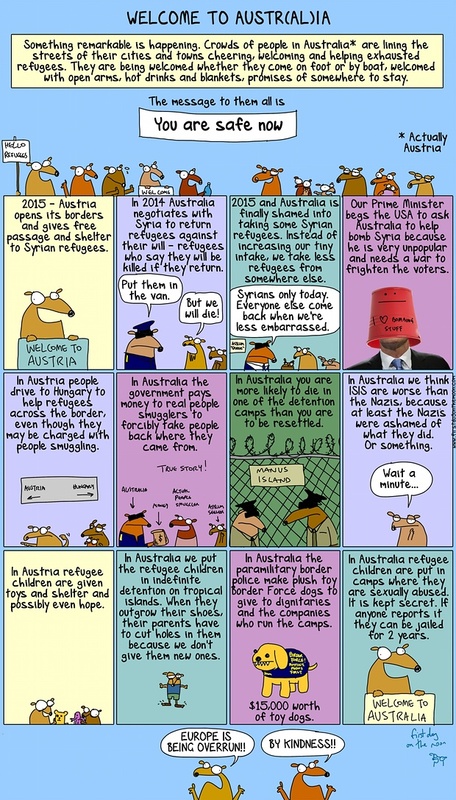 This is the First Dog on the Moon’s discussion about the differences between Austria and Australia – Welcome to Australia, where we greet refugees with open arms and hot drinks. Oh wait, that’s Austria. It appeared in the Guardian on September 7, 2015. And now that you have read the cartoon here is something to do. My homeuniversity has engaged Transfield Services to manage outsourced work for the institution. There is now a strong staff and community campaign designed to reverse this appalling decision. The mind boggles at how the institution could think this was an appropriate thing to do. They pay high salaries to managers in the so-called ‘risk management’ area of the administration. What were they doing when this contract was being devised and discussed? This 90-second speech appeared in the UK Guardian and sums up the first two years of the conservative federal government in Australia. I was listening to Toots Hibbert all morning while I worked. Toots and the Maytals are one of my favourite ‘up’ bands. Here he is with a cast of many from all around the World singing and playing “Reggae Got Soul”, which was one of the band’s classic songs. This is part of the – Playing for Change – project, which aims to connect the world through music. It does a great job. So get those feet moving! If you are in Melbourne Sunday, my band – Pressure Drop – will be playing at the Kindred Studios, Whitehall Street, Yarraville, Victoria from 15:00. This is a great afternoon. Spot on with your assessment of this federal government Bill. It is the worst and most incompetent government that I have seen in this country, and I well remember every government from Menzies onwards. Bearing in mind that this lot have been applying a wrecking ball to the Australian economy, some other descriptive words spring to mind — “seriously deranged”. That rather depends upon the emphasis placed on the words. It’s very useful. It provides a big identifying marker. and bonuses to the profit side. to make much labour redundant .We already have the AI to make all driving jobs obsolete . I find the inference that only central bankers and bankers in general can be trusted the most insidious. I suspect there are people in Greece who would disagree (those suing the central bank for example). Always remember you can get the same effect as a central bank running policy by simply abolishing all political parties and imposing a one party state. That way you get certainty over time, decisions are made rapidly (since there is no debate), no change of direction, etc. All the ‘good things’ that those championing CB rule propose. And of course you also get an dictatorial autocracy where the status quo is brutally maintained – as we’ve seen when the Greece government decided it wanted to go in a different direction. This is all about maintaining the One Truth for all time and rendering the democratic process irrelevant. Not sure about your idea that “The collateral should be the estimated value of the income stream on the asset for which the loan is being advanced.” Strikes me that if the value of an asset comfortably exceeds the amount of the relevant loan, and there is no income stream at all, the collateral is good enough. Indeed, the latter sort of “no income” collateral is what pawnbrokers specialise in, and I see nothing wrong with pawnbroking. However, I agree that off balance sheet stuff should be forbidden. Why it was ever allowed is a mystery. I like your argument that because independent central banks are in some senses undemocratic that therefor independent central banks are similar to a one party state. That argument could be put the other way round as follows. A one party state would want everything controlled from the centre, thus it would abolish central bank independence. I imagine the central bank under Saddam Hussein, Stalin, etc did what they were told to do. Which of course proves that the UK prior to 1997 when the BoE got independence was a Stalinist or Nazi regime (ho ho). People who mangle arguments to fit a belief like that generally end up writing for The Watchtower. Bill, are you talking about Ann Pettifor when she was talking about her experience in Africa? If I was going to be commenting on some particular person I would have mentioned their name. The statement was deliberately general to keep the discussion at the level of principle. Why is it that central tend to be staffed, at the top anyway, by conservatives committed to price stability above all else? It should be theoretically possible that central bankers are leftists whose priority is full employment. In your piece you refer to Next, and the Citizen UK report refers to Tesco. These are both large corporations employing hundreds of thousands of people. When the living wage is introduced their profits will be reduced by the amount of the additional wage bill. (There will also be a reduction in Corporation tax, but I doubt if this will compensate). They are subject to market forces so they will probably not be able to increase their prices. As you say, their CEOs are unlikely to take a pay cut, so the slack will have to be taken up in decreased dividends to shareholders. Plus, probably, a culling of the number of employees. It is unlikely to be inflationary. However, a huge number of UK firms are Small and Medium Enterprises (SMEs). Until I retired last July I acted for a typical SME, a small chain (3) of fast food outlets. The company was incorporated, had one owner/shareholder, around 15 part-time workers, and a full-time manager on each site. The workers were all paid minimum wage. The company did not pay corporation tax as the owner drew a salary that soaked up any profits, and it did not pay dividends as a result. (For accountant readers we did do a computation to ensure this was the most tax-efficient). When the Living Wage is introduced the cost will come straight off this company’s bottom line. The owner is not drawing the millions that the CEOs of large corporations are enjoying – in fact he is not much above the minimum wage himself. To some extent he is constrained by market forces in his pricing – but then so are his competitors. So he will have no option but to increase his prices – or go out of business (a distinct possiblity). SMEs account for 99.3% of businesses in the UK and account for 47.8% of private sector employment (source Federation of Small Businesses). This is not to mention the huge army of self-employed, many of whom will completely lose their Working Tax Credit even though they earn well below the existing minimum wage. I leave the reader to decide if the Living Wage is potentially inflationary. the problem is now do we untangle the banking fraternity from the political establishment, and that includes the treasury and the central bank. There is only one unelected member who sits in the House of Commons and he is probably the most powerful member. He is the remembrancer – representative of the city of London, pouring over legislation with his legal team ‘protecting the interests’ of the city. The city of London and the banking establishment will I’m sure fight tooth and nail to protect their perceived God given rights. Still ok with that. If not why is this different to the original statement? Exactly why should a business stay in business when it can’t pay its costs? If that was the rent, or the rates, or the gas bill you would say that the business should go into administration, but because it is workers *being paid below a living wage* apparently it’s ok. Businesses that can’t pay their way go bust. Thousands of them all the time. When they go bust they make space for those businesses with better processes and superior investment strategies. That’s capitalism – the brutal law of the jungle. Things die. They are meant to. Things only improve when there is death. Fear of death drives the improvement. There’s far too many people wanting to take the capitalist animals out of the wild and put them in a protected zoo where no harm can ever come to them. the problem thou Neil is that paying everyone a decent living wage has never happened. So it is unlikely that firms which do not will be replaced with firms that do. my sanisbury shop a new box set of game of thrones when it comes out from Amazon. and put downwards pressure on wages and profits all the way down their supply lines. It’s odd that the top end of town’s extravagant wages never trigger the inflation argument? It’s only when the peons, serfs, gophers and peasants talk of a mere increase in their wages that the prospect of inflation is a concern. Shows what Abbott is really like “off mic.” Disgusting. Strange that it is still necessary to point out flaws in some of the logic above. Nigel Hargreaves: When the living wage is introduced their profits will be reduced by the amount of the additional wage bill. Umm, no. Profits = revenues – costs. Costs going up doesn’t mean profits will go down, if revenues go up. There is every reason, from logic and experience, to expect that this will happen. Workers spend what they get. Capitalists get what they spend. Kevin Harding:the problem thou Neil is that paying everyone a decent living wage has never happened. Umm, no. You could afford things better if nations started using halfway sane economics again, if such workers were paid more. Workers being paid sub-living wages & the unemployed are being robbed, being immiserated – for no reason at all, to nobody’s benefit except for that of a tiny, tiny minority that enjoys the spectacle of suffering, and an enormously larger majority deceived and befuddled by nonsense. God knows where this conspiracy theory sprang up from. Some archaic seat in the Commons chamber – which is no more powerful than the public gallery you can sit in – is not the problem. The problem is the Westminster village and the groupthink that goes on within that arena from the parliamentary members wrapped in their coats of lobbyists. What happens inside the House of Commons is the least of the UK’s worries. The real impact is outside. If the private sector is unable to do that then (and of course it can’t if it is pursuing the road to productivity) then we need a flourishing public sector and a Job Guarantee to provide the necessary work and wages. as unfit for human habitation(such words stay with you) when I was 17.
of full employment did provide tremendous material advances for the poorest in society. I agree we should raise the minimum wage .I agree the state should employ more people. tomorrow in the UK (especially with current rent levels) is fanciful. Just to reiterate I absolutely share the goal of work and a decent income for all. into a historical political perspective. to the then maximum demand of social democracy the socialist transformation of society. incompatable with privately owned firms. regime I think we can move towards the goal I think we all share but it is going to take some time. it has done so on the back of others low wages. As for how far the less developed world has to go to achieve decent living conditions for all. Yes, the workers were slaves. All workers are slaves except in the very laudible case of John Lewis Partnership where they are all Shareholders. That also used to be the case with Asda, if I remember correctly, until the firm was taken over by Wallmart. In fact, the business to which I am referring closed two of its sites and sold the third. All employees were made redundant. The State paid their wages and redundancy pay from the Insolvency Fund. The owner is now unemployed. Is this what we want? One might argue that this chap is incompetent and deserves to go out of business. But he isn’t because he started up the firm in 2003 from nothing with one site, expanded over the next couple of years to the three, and profits were very healthy. It was only after the GFC that things went wrong as his costs escalated and he wasn’t able to increase his prices enough to compensate. He is a victim of circumstances. Some Guy – yes, you are quite right. It was Henry Ford’s argument that if you pay the workers enough they will buy your products, hence your revenue will go up. Trouble is Neo-Liberalism has got us into a rut that will be hard to get out of. Firms come and go. It’s the way capitalism works. Isn’t it a shame, though? The government should not only be protecting workers by ensuring full employment, but also small firms that are the life-blood of (certainly the UK) economy. I am absolutely not saying that the Living Wage is a bad thing – bring it on. Just that it will cause inflation. Again, not a bad thing so long as the BoE does not react by hiking interest rates. Then you ban unnecessary commodities speculation and use strong auto stabilisers to prevent recessions. What is “life blood”? Vague.